Buildbase BMW’s Ryuchici Kiyonari and Josh Waters make it two international winners as they spilt the winners trophies together at Brands Hatch, with the British summer-time weather creating drama giving us one dry and one wet race. We had a dramatic start to race one with two warm up laps needed, after John Hopkins had a problem before the lights went out, which resulted in the race being shortened to 19 laps. It was the front three Kawasaki’s of Byrne, Walker and Ellison who led the way for the opening four laps with the Lloyds British GBmoto team-mates not letting Byrne break away. 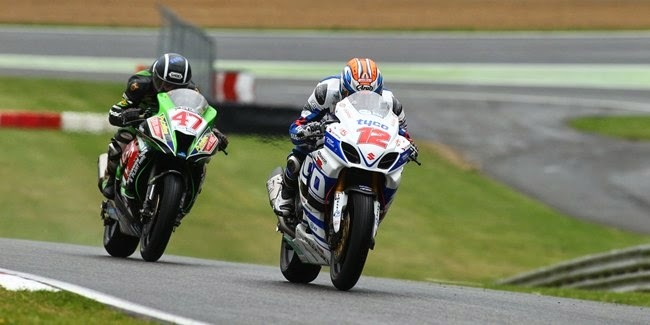 The three were closely followed by Kiyonari and Brookes. Barry Burrell had a nasty crash on the WD40 machine, which meant the safety car was brought out half way through lap four. With the riders bunching up into a big group the safety car went in on the end of the sixth lap, allowing the riders to get back up to speed. Byrne was unable to shake off his fellow Kawasaki riders with Kiyo not far behind, and on the 14th of 19 laps the Japanese rider was able to hit the front with his Buildbase BMW following a close battle with Byrne and Ellison. Byrne didn’t give up however and he soon retook the lead from Kiyonari, and the pair battled for the closing laps before Kiyonari put in the race winning move on the penultimate lap to take his second win in a fortnight. With the threat of a storm looming, the second BSB race of the day got underway but came to a premature end following a massive crash for race leader Ellison on lap two, where he lost the rear of his Kawasaki. After one lap following the safety car, the race was red flagged when fuel was found on the track following Mainwaring’s crash at Westfield bend. Shortened to an 18 lap race, the riders lined up on the grid and the race was re-started although just three laps in the red flags were waved again, this time for rain. Re-entering the pits, riders and teams sat in the pits as the rain got heavier and the race was declared wet, across 15 laps. As the lights go out for the third and final time, Byrne got a good start and lead the way, with Kiyonari running in second ahead of Easton and Walker. Race one winner Kiyonari seemed to adjust his fast pace over to the wet as he took the lead on second lap. However with a big group of five bunched up at the front, the Japanese rider soon lost his lead to Richard Cooper on the Anvil Hire TAG Racing Kawasaki on the third lap. A double victory clearly wasn’t on the card for Kiyonari as he slipped down from first to ninth position over just one lap, and was then out of the race on the seventh lap of 15. Tyco Suzuki’s Josh Waters then took the lead and didn’t look back, creating a bigger gap from second position and finished 4.627s ahead of Richard Cooper. Follow the links for a full list of race one and race two results. Next Next post: Jackson thrown into deep end on BSB debut: "I might be suffering a bit tomorrow!"